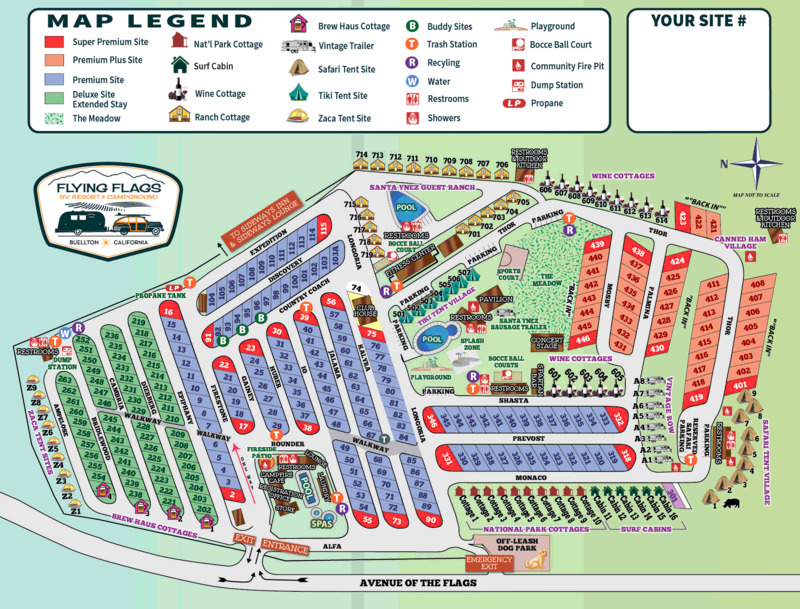 Ask fellow campers about "Flying Flags RV Resort & Campground" and nearby attractions. Best game in town. Big park with lots of choices, activities, places for kids to play. Trees for shade, dirt and cement sites. Lots of driving room but close spaces. Security is a problem with keeping quiet time start at 10pm. Good park for all age groups. We camped at Flying Flags RV Resort & Campground in a Travel Trailer. Really crowded Thursday through Sunday. Just crowded all other days until summer, then its packed every day. Parked us right across from the laundry at my request. Nice site, fresh cookies at registration, pool looked nice. We only stayed one night. Had dinner at Split Pea Andersons across the main street. Albertson's Grocery right down the road, across the freeway. No noise. Just a really nice park that we stay in anytime we are headed down the coast. 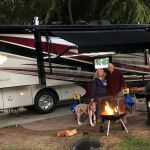 We camped at Flying Flags RV Resort & Campground in a Fifth Wheel. Solvang, Mission Santa Inez, Lompoc for Mission, flowers and murals, good restaurants. This a great family oriented park with lots to do onsite. Lots of young families frolicking here on the weekend, but more quiet and subdued on the weekdays. The only thing that annoyed me was the 8AM weedwackers going off from the maintenance crew. It's very clean and well maintained. Enjoyed the Friday night live music from the restaurant area. Not too loud and very enjoyable to hear from inside our rig until 10. Nice places to eat offsite within walking distance. A giant Albersons is just around the corner. 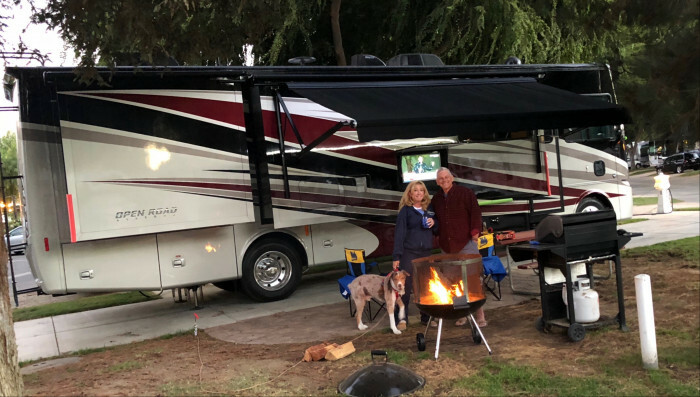 We camped at Flying Flags RV Resort & Campground in a Fifth Wheel. Solvang which is a short distance away has very popular Danish bakeries. Always a line, but many, many eye popping, delicious morsels of every shape and color. I think it's impossible to just buy one piece, and before you know it, you have a small box which you crack open and start to eat as you walk down the sidewalk towards your rig. We stayed at Flying Flags after 3 days at Jalama and thoughly enjoyed our stay. Park, bathrooms, showers, and laundry room were all spotless. We stayed mid week and there wasn't a lot going on. Weekends are more active. The park is close to all kinds of fun things to do though. 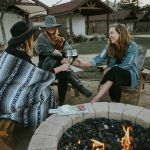 Buellton has beer and wine tasting and Solvang is not far away. Santa Ynez is also within a short drive. Great time! We camped at Flying Flags RV Resort & Campground in a Motorhome. Upper class RV park with two swimming pools. Very neatly kept, well managed. Bit too expensive for the quick stayover we had and there was some construction going on near our site which gave some discomfort. Watch the entrance if arriving in dark at night. We almost used what later seemed to be an emergency exit. We camped at Flying Flags RV Resort & Campground in a Motorhome. Very nice park with nice level sites. Clean, and spacious bathrooms with showers. Several pools to choose from, and a lot of other amenities. We camped at Flying Flags RV Resort & Campground in a Motorhome. Well located if you want to visit Solvang. The check in process went smoothly until we asked if they had a Good Sam discount. We were told that it was our responsiblility to ask for it first thing. Since we didn't ask, the full price had already been charged to our credit card. We responded that parks usually ask us if we have any credit related affiliations, like Good Sam. We were told that it absolutely was not their job to ask us first. Beware of the deluxe pull through sites. They are very close together, the grass was dead, no shade, and no picnic table. The more expensive sites have nice lawns, shade, more space and nice hook up equipment. The $80 price includes a $10 per night resort fee. We did not use any of the amenities and there were no activities offered during the week. They have music and wine tasting only on the weekends. We were there during the week. The location was g00d for exploring Jalama Beach, Santa Barbara and Solvang. We camped at Flying Flags RV Resort & Campground in a Motorhome. A very nice park BUT they charge a $10/night ($20/night in the rooms) "facility fee" and when I ask to reserve the bocce ball courts they said it cost $250 for 2 hours and $500 for 4 hours. You've got to be kidding. I thought the facility fee meant we could use the facilities. Think again. I have never heard of such a thing. We camped at Flying Flags RV Resort & Campground in a Motorhome. We have stayed at this facility on many occasions over the past six years during travels up and down the CA coast. We have never had any problems and it is one of our favorite RV parks anywhere. I feel that it is well managed and kept clean. 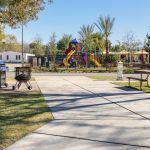 There have been many recent ongoing construction improvements and upgrades made to the park over the past couple of years. Bonus: You get two chocolate chip cookies when you check in. Home baked and quite yummy! We camped at Flying Flags RV Resort & Campground in a Travel Trailer. As an added bonus, there is a casual dining spot about one half mile west right off of Rt 246 in Industrial Way, called Industrial Eats. Don't be mislead by the name. The food at this place is absolutely incredible and it is by far, the best place to eat anywhere in the Buellton area. This restaurant can get mobbed on the weekends but, you will not be disappointed in their cuisine. Thank you for your feedback. We look forward to hosting you again along your travels. Flying Flags is a large well appointed Park in Buellton. Thee is lots to do, especially if you have kids. The WiFi was weak to non-existent and the roads/turns on tight if you are driving a Big Rig. We were assigned Site 115, a Super Site. The Site had a large corner yard, patio, picnic table and BBQ grill. There are two "downers" for this site, 1.) it is located across from the Parks maintenance yard so there is a lot of traffic and noise during the day and if you're driving a Big Rig (45 Footer Class A) plan on backing out of the site. To "pulling" out of the site is not possible due to a large tree, fence, too narrow of a road and the immediate 170 degree turn required to exit. We camped at Flying Flags RV Resort & Campground in a Motorhome. Thank you for your feedback. We are always happy to switch guests to a more desirable site once these concerns are brought to our attention. We hope to be of service to you again in the future. Very nice resort style park. Our first site pull through site (373) had extremely sloped ramps, and would not work for our camper. In trying to pull through, I scraped and bent one of our stabilizers on the sloped ramp. A very helpful park employee helped us back out of the site and access the damage. He then took me around to show us alternative sites, and we selected site #16, and end row site with a nice grass area, a barbecue grill, and a portable fire pit. Most importantly, it was flat. This same employee helped us straighten the stabilizer. Fortunately it was not severely damaged. Park employees called me by name during our three day stay. We didn't go to the café and barbecue restaurant, as the are open only on weekends, but they looked like fun. if you are assigned to any of the sites in the area near #73, take a very close look at the slopes before you pull in. This is a really beautiful park. We camped at Flying Flags RV Resort & Campground in a Travel Trailer. Albertsons grocery store nearby. The Danish town of Solvang is fun, but a bit "touristy." The BitO'Denmark restaurant has very nice decor, and good food. The Farmers, Market had fresh fruit and vegatables. The town of Morro Bay (1+ hr. north) Is a beautifull coastal town. Reccommend The Harbor Hut restaurant and the kite shop. Thank you for your kind feedback. We are happy to provide exceptional service! This CG is large, meaning a lot of rowdy children and adults. Staff was very good, CG was clean. Wasn't very happy with the length and width of our space. Did like the grass and shrub at our site.We drove to Surf (west on 246) to the ocean, very nice ride. Also visited Ostrich Land (between CG and Solvang on 246) Solvang, Los Olivos, Santa Ynez, Lompoc and Gaviota State Park. Lots of wineries and wine tasting in the near by country side. For the children, there is a splash pad and pool. At the office, there is another pool and adult spa. Our site was packed gravel, which was a premium pull thru and not long enough for TT and truck. We made the mistake of staying over the Easter weekend, with tons of speeding, bike riding children and not watching for vehicles. BE VERY CAREFUL. Not a problem of the CG, but it appears they cater to rowdy campers who are very noisy and inconsiderate by cutting thru camp sites. We finally blocked the path with our lawn chairs. We would visit here again, but not on a holiday or regular weekend. We camped at Flying Flags RV Resort & Campground in a Travel Trailer. Just north for the CG, you'll find Mother Hubbard's Restaurant, great food. Places to visit would be Surf (on the border of Vandenberg AFB), Los Olivos, Santa Ynez, Gavoita State Beach, Solvang and the Chumash Casino. Thank you for your feedback. We look forward to sharing a peaceful experience with you. This is a nice and well kept park. But they have been doing a lot of development and have no competition in the immediate area, so their prices reflect that. They have instituted a three week stay limit and are phasing out their long term residents. The park is next to US-101, so some sites have more traffic noise than others. We camped at Flying Flags RV Resort & Campground in a Motorhome. Many wineries in the area. The Danish themed tourist town of Solvang is nearby. The Santa Barbara area is about a 45 minute drive. Thank you for the feedback. We hope you will plan future visits with us. Thank you for your review. We look forward to hosting you again! One night stay to break up our trip from central California back to San Diego. We had a pull through site, easy to access and level. The grandchildren enjoyed the water play area and playground; grandma forgot to pack a swim suit so no pool use. There were LOTS of families enjoying the family pool though. Not so great: I realize this campground caters to larger rigs with full hook-ups, but it seems strange that there are only 2 restroom areas (although I think one was under construction/renovation) and only one shower facility. I don't count the outside shower by the family pool. We camped at Flying Flags RV Resort & Campground in a Travel Trailer. Thank you for your feedback. We will use this review to continue improving upon our amenities and services. Three towns within 7 or 8 miles and several others in 45 minute or less drive. The Danish Village of Solvang is 4 miles easy drive away. The town of Buellton is within walking distance. Santa Barbara is about 40 miles away. Solvang, Buellton. Fun to explore the "Sideways" hotel located adjacent to the RV park where portions of the movie Sideways were filmed. Beaches of Northern Santa Barbara are just 20 minutes south and there are countless other fun places to visit. Taco Roco Mexican restaurant is across the street from the park. Good food. The pancake house is also down the street from the park. Both restaurants are within walking distance. Hitching Post II in Buellton (made famous by the movie Sideways) is an awesome place for dinner! 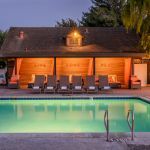 Great spot to stay if you're visiting Solvang/Santa Ynez Valley! Also accessible to Goleta beach (about 15 min south on the 101) and Santa Barbara for day trips. We had a great dinner at the Solvang Brewing Company and decided not to fight the crowds at the popular "Paula's Pancake House" and found a great breakfast place one block off the main road - Fresco Valley Cafe! We also visited Ostrichland USA - a fun little activity for the kids. You can feed the ostriches and emus. Aj Spurs, hitching post, also visit downtown Solvang just 5 min away. There is a ton of stuff to see and do in the area. Easy drive to Santa Barbara or Pismo Beach. The town of Solvang is 10 minutes away and there is a big casino there. Also a lot of golf choices and wineries in the area. 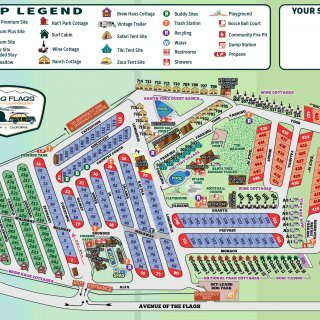 This campground is 15 minutes from the danish village Solvang and 20 minutes from Lompoc. Go into Solvang get some pastries. Also wine tasting at a $$. Lot of restaurants in the area. It is worth staying a few days to take advantage of the area offerings. Very nice large gas fire pit near store to sit and have your hand dipped ice cream or glass of wine. Park store limited, but there is an Alberson's a few miles away. No Walgreens or Wal Mart in area. CVS store nearby. There are gas stations in Solvang for gassers, but check them out before taking your rig in. We were too tired to go out and eat so we asked the front desk about pizza delivery. They suggested Gino's Pizza as they deliver right to your site. The Pizza was fantastic!! Order a medium pizza but it looked more like a large to me, and boy was it good. Probably the best pizza I've had in a while. Highly recommend giving them a try. A little pricey, but worth every penny. Terrific restaurants include Hitching Post (of Sideways fame) which serves their amazing hamburgers ONLY Mon, Tues, and Wed. in the bar area. The locals love this place. Also some really good restaurants in Solvang plus lots of shops if that's your thing. This park is very close to Solvang, which is a Danish community with lots of shopping and restaurants. There are many wineries around the park, so you can go winetasting. Mortenson's Bakery. Get a strudel for the wife. It's almost as good as giving her diamonds, but way cheaper. A local grocery store within walking distance (Albertson's), a Pea Soup Anderson's, and of course, Solvang. This facility is very convenient to all places in the Santa Ynez Valley. Lots of shopping and restaurants nearby. A lot to do and see--Solvang and wineries. Lots of sites - Scandinavian themed village (touristy), wineries, casino, little western towns, ocean is not too far a drive. Do a bit of research, as there is plenty of nearby activities to keep you busy. Short distance to Solvang. Great steak dinner at Hitching Post II. The town of Solvang about 3 miles away is a great place to visit, especially near Christmas time. Lots to do in Solvang which is only 4 miles away. If you plan to get to the CG early, call before you get in line. Several people told me they were sent back on the street because they were too early. The entrance and exit cross so if you have to leave when the check in line is long, you will sit there idling. If you visit the charming Danish town of Solvang, avoid the touristy section, and try Birkholm's, the ORIGINAL Solvang bakery. 9 varieties of cookies in tub for $16 (the others on the main street charge up to $21 for smaller tub / 6 varieties). And friendly servers! Close to Danish community of Solvang. Plenty of shopping, wineries, farms and food. Do go over to Solvang! Pea Soup Anderson's is nearby. Allow yourself plenty of time to explore the area. Visit Anderson's Pea Soup, good food and easy walk. We found walking for Groceries and fast food easy to do. You may not have to drive too far, unless you are going to visit wineries. Are you affiliated with Flying Flags RV Resort & Campground ?